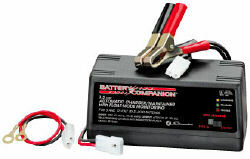 Unique automatic battery charger maintains both 6 and 12 volt batteries keeping them at full charge using float-mode monitoring. Perfect for charging small batteries. Great for maintaining small and large batteries kept in storage. This product works well with: Autos, Light Trucks, Motorcycles, ATV's, Lawn Mowers, Snowmobiles and other 6 & 12 volt batteries. 6 5/8 X 3 3/8 X 5 3/16"